"...Johnson sings the praises of piano, bass and drum trios by plunking himself in the studio with various pianists and drummers. The results of this simple format are hardly simplistic....these trios remind us that with back to the basics, less can be more." "This versatile, creative, oft-inspired jazz bassist has toured with everyone from blaring sky notes trumpeter Maynard Ferguson, to discreet nylon-string guitar poet Gene Bertoncini. Tonight, the invaluable local bassist celebrates a provocative new Igmod Records CD, Trios, which features him in the company of seven pianists and six drummers! The bevy of bandmates includes nationally famous names, plus some of the best sidemen the Twin Cities has to offer. Most of the Minnesota gang will be on hand to hail Johnson's gem, which features original tunes that suggest the able bass man may have largely untapped potential as a songwriter, too." 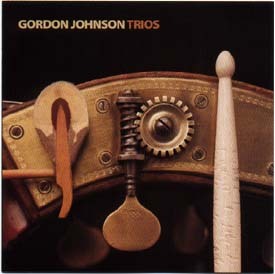 "Previously known for his electric work with Maynard Ferguson, Chuck Mangione, and Roy Buchanan, Minneapolis-based Gordon Johnson has gravitated toward the upright in recent years. On his solo debut he makes a significant contribution the the piano-trio legacy, anchoring seven different lineups. Throughout, Johnson's support and solo work retain a driving elegance that's best heard on such tracks as "The Jazz Therapist" and the Dr. John nod, "Mac's Ribs"." "Bringing in seven different pianists and six drummers for a series of 11 trio performances with bassist Gordy Johnson is an inspired concept, for it enhances the presence of a gently compelling stylist on the most self-effacing instrument in jazz. Johnson sounds both more adventurous and more at ease in the four tunes he plays alongside ex-Weather Report drummer Peter Erskine (who was Johnson's old cohort in the Maynard Ferguson band two decades ago) and local pianist Chris Lomheim, whose superb, harmonically oriented compositions and absorbing introspection stimulate creativity from the rhythm section. "Trios" is less consistently satisfying on the more uptempo, quasi-funky numbers. Highlights include a spirited "On The Trail" with pianist Bobby Peterson and drummer Gordy Knudtson, and a jam between Johnson, pianist John Burr and drummer Joe Pulice on "Face Lift" the rousing finale." "Seven pianists, six drummers, one bassist -and a partridge, er, 11 songs. That's the interesting concept for Twin Cities bassist Gordon Johnson's first album as a leader. The result is a stimulating and entertaining mix. Johnson, among first-call bassists locally, and with a national reputation (he's been on some 50 records), demonstrates his versatility and skill without hogging the limelight. His trio mates are pianists John R. Burr, Bill Carrothers, Manfredo Fest, Biff Hannon, Chris Lomheim, Bobby Peterson, Benny Weinbeck and drummers Dave Anania, Jay Epstein, Peter Erskine, Gordy Knudtson, Dave Mancini, and Joe Pulice. Lomheim, Hannon, Fest ,Weinbeck, Burr and Johnson contribute original compositions. Carrothers-Epstein give us a dark, edgy spiritual "Just A Closer Walk With Thee"; on Michael McDonald's "I Can Let Go Now" and Johnson's funereal "Lo Siento" Lomheim-Erskine are ruminative and romantic; Hannon-Mancini contribute a pretty waltz; there's a sprightly Fest-Epstein bossa nova. When the album gets a little lethargic and over-earnest, Peterson rushes to the rescue (with Knudtson) with playful, hard-swinging versions of "Wrap Your Troubles In Dreams" and "On The Trail"."